Brexit Extension Gives UK More Time to Mess Up Brexit, E.U. U.K. Gets More Time to Mess Up Brexit, and Maybe the E.U. The European Union agreed in the wee hours of Thursday morning to postpone the Brexit deadline to October 31, giving the U.K. up to six more months to finalize the terms of its departure from the bloc and averting a no-deal crash-out tomorrow night. Under the terms of the flexible extension, agreed upon after hours of contentious talks at an emergency summit of European leaders in Brussels, the U.K. can leave before the end of October if the withdrawal agreement previously negotiated between Prime Minister Theresa May and her continental counterparts is ratified. If and when that happens, the U.K. will leave the E.U. on the first day of the following month. If the U.K. has not ratified the agreement by May 22, it must participate in the elections for a new European Parliament scheduled for May 23–26; if it fails to do so, it will leave the union with no deal on June 1. The final agreement is a compromise between the short extension May had requested — to June 30 — and the longer delay of as much as a year suggested by European Council president Donald Tusk and other E.U. officials. October 31 coincides with the changeover date between the current European Commission led by Jean-Claude Juncker and the next commission, which will be elected by the Parliament after it is seated in July. This would ostensibly mitigate the potential for the U.K. to be a disruptive presence in the E.U. as an active, but imminently departing, member state. The key figure in Wednesday night’s debate was reportedly French president Emmanuel Macron, who pushed back against the long delay favored by Germany and some other countries, arguing that it would disrupt the business of the E.U. Ironically, even as Macron was arguing for precisely what May wanted — Brexit by the end of June — his insistence was framed as being tough on the U.K., forcing them to shape up or ship out. Macron was criticized for what some diplomats saw as him pandering to his domestic political constituency rather than prioritizing the interests of the bloc. France has a particularly strong interest in avoiding a no-deal Brexit, as it would be hit harder by this disruption than most other E.U. countries, so his threats came off as empty posturing. Still, Macron levied some sound arguments for getting this endless process over with sooner rather than later. The E.U. has other problems to deal with beyond Brexit, including the sweeping reforms Macron has proposed to correct some of the institutional shortcomings that made Brexit possible. A bigger concern, however, is the prospect of the U.K. being represented in the next European Parliament despite having one foot out the door. To understand the absurdity of this situation, imagine that a U.S. state passed a referendum last year to secede from the union. Let’s say Texas wanted to control its own border with Mexico, without having to comply with pesky federal law, and that instead of fighting another civil war about it, the federal government decided to let them go. Say this “Texit” ballot measure was worded so that it wouldn’t come into effect until 2022, so Texas also sent a delegation to Congress last year and intended to participate in next year’s elections as well. Why would anyone expect these representatives to act in good faith and uphold the best interests of a union to which they would soon no longer belong? The same logic holds for letting the U.K. elect another slate of MEPs. The British delegation to the current European Parliament is dominated by Euro-skeptics; the next, if it comes to that, will almost certainly be even more hostile to the E.U. Hard-Brexit advocates have openly threatened to come into the next Parliament as obstructionists and troublemakers. For these hard-liners, this plan to jam the gears may be little more than petty revenge politics, a way to frustrate the European Council and embarrass Theresa May as payback for their failure to deliver Brexit on time. But they are by no means the only MEPs pushing a Euro-skeptic agenda; a U.K. presence in the next Parliament could be useful to the far-right faction that aims to take over the chamber this year and essentially legislate the E.U. as we know it out of existence. If the U.K. participates in next month’s European elections, the third-largest national delegation to the European Parliament will be mainly a secessionist faction, at least for the first several months of its term. Macron and other European leaders are right to find this scenario extremely problematic, which is why the French president insisted on language in Thursday morning’s communiqué stressing the U.K.’s commitment “to act in a constructive and responsible manner throughout the extension in accordance with the duty of sincere cooperation … and refrain from any measure which could jeopardise the attainment of the Union’s objectives.” It also notes that the 27 member states not including the U.K. will continue to meet separately to discuss issues pertaining to the post-Brexit E.U. It’s not clear, however, what kind of legal force those conditions would have, what the consequences would be if the U.K. doesn’t abide by them, or why the Europeans should have any confidence that it would when the Brexiteers have explicitly promised not to. If the consequence is expulsion from the union, that just gives them another way to get the hard Brexit they want. Likewise, the stipulation that the U.K. will withdraw automatically if it fails to hold elections next month gives the Brexiteers a reason to try to prevent those elections from happening. The case for giving the U.K. even more time to get its act together rests primarily on the fact that a no-deal Brexit could do considerable economic harm to other European countries as well, but another six months of uncertainty is hardly welcome news for the business community. For U.K. businesses, the Sun’s Steve Hawkes commented on Twitter, it may in fact be the worst possible outcome. The other rationale for a longer delay is Tusk’s thinly veiled hope that the U.K. ultimately revokes Article 50 and backs out of Brexit, as the communiqué pointedly reaffirms that they can do, unilaterally, at any time. The extension gives the U.K. just enough time to organize a second Brexit referendum, and has already prompted speculation to that effect, but May won’t allow a second referendum to happen on her watch and is determined not to leave office without delivering Brexit. From a political and institutional perspective, it could be harmful to the E.U. if the U.K. were to remain a member state after October 31. In that scenario, Brexiteer MEPs will have five years to obstruct and disrupt E.U. business, not just four months. In the long run, the economic disruption of a no-deal Brexit might be less dangerous to Europe than a right-wing populist revolt in the legislature. The question now, as ever, is whether this brings the U.K. Parliament any closer to passing May’s Brexit deal or some viable alternative. The European Council underscored in its statement that it will not renegotiate the withdrawal agreement, but Tusk left open the possibility of the E.U. approving an amended post-Brexit trade arrangement like the customs union and “Common Market 2.0” proposals that were narrowly defeated in the U.K. Parliament last week. Unfortunately, May’s ongoing talks with the opposition Labour Party aren’t making much headway, coming up against some “fundamental disagreements” about the country’s future relationship with Europe. 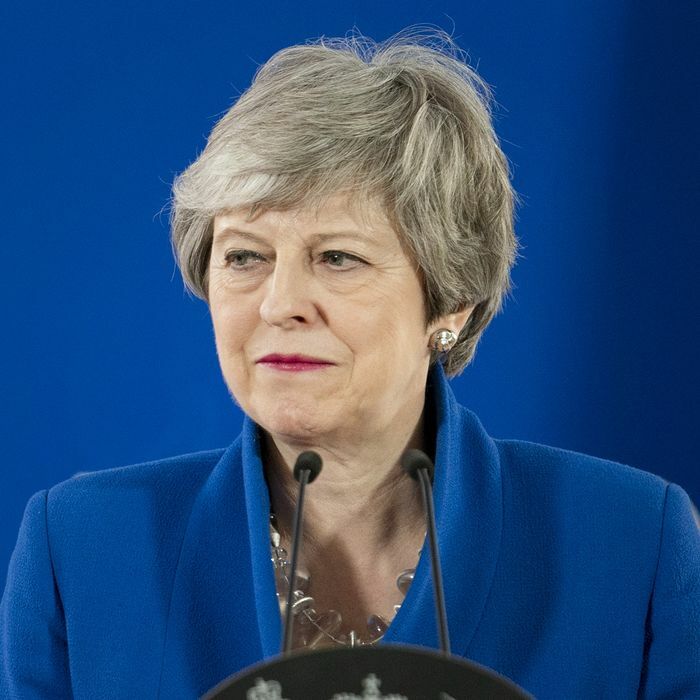 May’s position within her own Conservative Party is also tenuous; while she is immune to another internal leadership challenge until next year, staunchly pro-Brexit Tories are furious with these delays and will be even more outraged at having to hold another European election. Even more moderate Conservatives are worried about going into the next general election without having delivered on their core promise to voters. In any case, the new deadline may be October 31 on paper, but Theresa May doesn’t want to see the U.K. seat new MEPs any more than Emmanuel Macron does. She will surely do her best to get Brexit done by May 22 or June 30 at the latest, but her best never seems to be good enough. In the meantime, both her nightmares — no deal and no Brexit — remain well within the realm of possibility.